Available as low as $7.99 per coin over spot! Hippopotamuses are one of the largest and most dangerous animals on earth. Their aggressive and unpredictable natures are what make them so dangerous. Native only to Africa, it is only fitting that Rwanda has decided to put these great beasts on a coin. The 2017 1 oz Silver Rwandan Hippo Coin is now available on Silver.com. Tenth release in the popular Rwandan Wildlife Series. Consists of one troy ounce of .999 fine silver in Brilliant Uncirculated condition. Features the latest design of a Hippopotamus on the popular coin series. The Rwandan Wildlife Series honors a number of animals that can be seen in Africa. The obverse and reverse designs stay the same each year, with the exception of the animal featured on the obverse. Each year, a new animal that is native to Africa will grace the obverse of the coins. In 2017, that animal is the hippo. 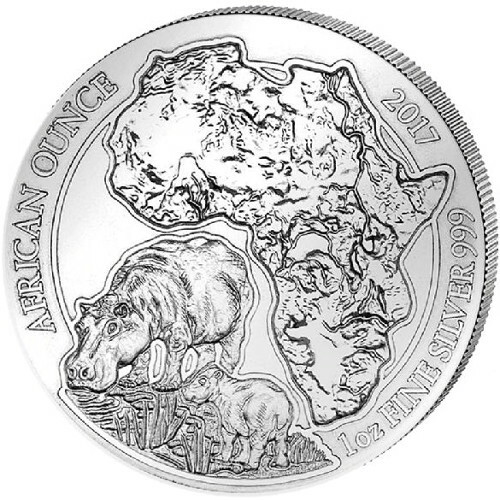 The obverse of each 2017 1 oz Silver Rwandan Hippo Coin features the image of the African continent with its geographic features visible. On the bottom left of each coin, you can see hippo calf with its mother. Hippos are the third largest land mammal on the planet, and males can weigh more than 3,000 pounds. These semiaquatic mammals inhabit lakes, rivers and other bodies of water in Africa. During the day, hippos stay in the water or mud to keep cool. At dusk, they graze on grass. 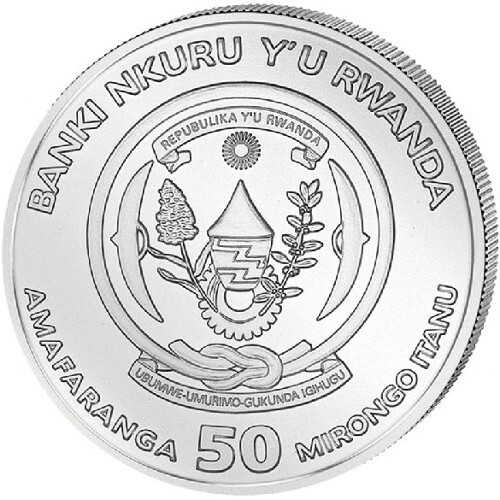 The reverse of each coin bears the image of the Rwandan coat of arms. Along with the coat of arms, you will also find the engravings of the issuing nation, central bank, face value and national motto. Each coin in this listing is in Brilliant Uncirculated condition. In this condition, the coins will show no signs of wear and tear, but they may have minor flaws, including spotted surfaces and breaks in the luster. These coins are minted by BH Mayer Mint in Germany, which was founded in 1871. The mint is family-owned and has been controlled by five generations of the same family since it was founded. Silver.com encourages all customers to ask questions when they arise. Please direct your questions about the 2016 1 oz Silver Rwandan Hippo Coin to an associate at 888-989-7223, connect with us online through our live chat, or submit an email with your question.